All transactions are safe and secure with a reliable history in online purchasing behind each of our associates. Buy the Bruce Lee Silhouette t-shirt to own Bruce Lee clothing and merchandise. 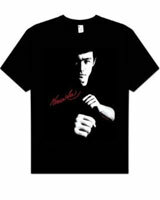 This Bruce Lee t-shirt features a black and white rendering of Bruce on the front in his fighting stance. He is ready to take on his next foe, and you will be too with this sharp black Bruce Lee tee. This is one of our bestselling pieces of Bruce Lee merchandise, and it is a must-have for any fan of Lee's movies. The front displays a silhouette of the legend, which lets everyone know that you're a martial arts master. Wear it underneath your Bruce Lee costume or to make everyone aware that you know kung fu. In addition to the Bruce Lee Silhouette tee above, browse the Bruce Lee Clothing Gallery for more apparel like men's and women's clothes, kids shirts or hoodies.